1. 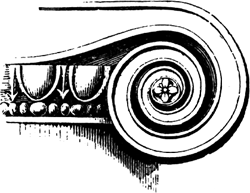 A spiral scroll, as on Ionic, Corinthian, or Composite capitals, or on consoles, etc. 2. A stair crook having an easement with a spiral section of stair rail.